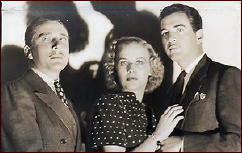 » A Movie Review by Walter Albert: ISLAND IN THE SKY (1938). 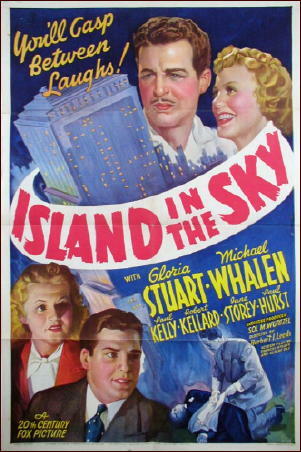 A Movie Review by Walter Albert: ISLAND IN THE SKY (1938). ISLAND IN THE SKY. 20th Century Fox, 1938. Gloria Stuart, Michael Whalen, Paul Kelly, Paul Hurst, June Storey, Leon Ames. Director: Herbert I. Leeds. Shown at Cinefest 19, Syracuse NY, March 1999. Beautiful Gloria Stuart is the fiancee of assistant D. A. Michael Whalen and when Whalen refuses to go out on a limb to save a young man on death row, who Stuart is convinced is innocent, she commandeers a reluctant Paul Hurst to help her prove the condemned man’s innocence. The climax is staged in an elegant roof-top restaurant and may strain your credibility but not your interest. This is Stuart’s film all the way and she commands the screen with such skill that you wonder why she interrupted her career so abruptly in 1946. Gloria Stuart and Michael Whalen worked well together several times. Professional Soldier, Poor Little Rich Girl, The Lady Escapes. After the war he strugles but kept on. From what I understand, Gloria Stuart did not need the money and her career was not going to morph into Myrna Loy’s. So she walked away. Smart girl. An unrelated follow up thought: I have just seen Ray Donovan and was appalled at not only the up front violence but the over all brutality seemingly beneath every moment. Give me the good old days and pictures like Island In The Sky, and a thousand others. I had exactly the same thought after reading your previous post in which you listed your favorite movies of the 30s 40s and 50s. Judy and I don’t go out to the movies any more, and from the trailers I see on TV, I have no desire to. It’s good to know about other pairings of Stuart and Whelan and maybe some of them will show up on TCM. We don’t have a movie theater in my town so I have to drive at least 25 miles to see a movie in a theater. In spite of that, I still manage to go out to have the unforgettable “big screen” experience every so often. I spent every weekend for more than a year going out to the movies and loved it! Of course, there were some turkeys, but most of them were great. Yes, yes, I subscribe to Netflix and I have 18 containers of personally owned dvds so I’m not likely to be without a film of some persuasion. I have now seen half of the 1200 plus episodes of Dark Shadows between my own collection and Netflix.